Each year, Oxford Dictionaries picks a “Word of the Year,” a term of that a group of experts finds reflects the mood or the preoccupations of the year and has “lasting potential as a word cultural significance.” Having discussed the unique issues posed by electronic cigarettes (“e-cigarettes”) on this blog, our San Francisco product liability attorney is not surprised to hear this year’s term is “vape.” The term, an abbreviation for vapor or vaporize, refers to inhaling and exhaling the fumes produced by an electronic cigarette or related device. E-cigarettes are battery operated devices that produce a vapor from liquid nicotine. With the rise in popularity, cities, states, and the federal government are all considering whether and how to regulate the devices. At the same time, researchers are examining the safety of vaping and its health impact. The San Francisco Chronicle reports that e-cigarette use has surpassed traditional smoking among teens in the United States. The popularity has both federal and state authorities considering whether and how to regulate the devices as health experts examine a range of issues including whether e-cigarettes help smokers quit or serve as something of a gateway into traditional smoking. The San Francisco Department of Public Health campaign is kicking off a campaign this week aimed at public awareness, with messages calling the devices harmful and referring to flavored versions as a way to hook young people on nicotine. Most health professionals say the devices expose users to fewer hazardous chemicals than regular cigarettes but the verdict is not yet in as to the overall impact on a user’s health. Sales are expected to grow 24% each year through 2018 and some analysts believe they will surpass traditional cigarettes for all users within a decade. Currently, according to the Chronicle article, e-cigarettes are largely unregulated. They do not count as medical devices and are not actually smoked so avoid the rules covering traditional cigarettes. Last April, the Food and Drug Administration announced plans to begin regulating the devices. San Francisco was among a number of cities that passed laws in 2014 treating e-cigarettes much like their traditional cousins. California lawmakers banned the sale of e-cigarettes to minors, but further legislative regulations have failed to gain traction. While some groups push for more regulation, the industry is fighting attempts to regulate e-cigarettes and there is concern about regulations that vary greatly from one municipality to the next. In June, Health News took a close look at e-cigarettes. While conceding that they are safer than traditional cigarettes, the researchers found e-cigarettes can deliver high levels of dangerous chemicals that have been linked to a range of health problems such as heart disease, diabetes, stroke, and asthma. 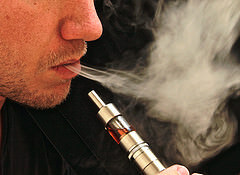 E-cigarette vapors contain known lung irritants and both known and suspected carcinogens. Additionally, the vapors may make it harder to kill dangerous germs. A study found mice that inhaled air containing MRSA bacteria previously exposed to e-cigarette vapors had three times the number of bacteria in their lungs compared to mice who breathed air containing unexposed germs. E-cigarettes may pose a significant health danger. There have also been numerous injuries as a result of malfunctioning e-cigarettes. If you or a loved one has been injured by electronic cigarettes, call our Northern California e-cigarette lawyer. Our team can help whether the injury is a result of a malfunctioning product or a health problem stemming from e-cigarette use.